The configuration I just changed is not being used? Use '/reload', '/dynmap reload' or restart your server. If this does not help, look in server.log for errors. How can I host Dynmap on my webserver (which is on the same machine)? Presuming your webserver is on the same machine as CraftBukkit is, use the guide to make Dynmap work without the internal webserver. I don't have a webserver, how can I show the map to others? Portforward TCP-port 8123 on your CraftBukkit server, so that everyone can visit Dynmap. For better security, you might want to use a webserver (like Nginx) that proxies traffic to Dynmap. Do this if you know how to do so. How can I host Dynmap on my webserver (which is on another machine)? Portforwarding, like above, might still be a good solution. If it is impossible to portforward, or you want to offload your CraftBukkit server, you can still periodically synchronize 'plugin/dynmap/web' between CraftBukkit and your webserver using RSync or FTP. However, you won't have any of the 'real-time' features that Dynmap provides (players, map-updates, chat, etc). If you don't mind tinkering a bit on Linux, you can still get the real-time features by using sshfs or fuseftp to mount the (remote) 'web/standalone' directory from your webserver onto your CraftBukkit server 'plugins/dynmap/web/standalone'. How can I integrate Dynmap on my website? Make sure Dynmap is available for anyone on a certain URL. If you've done portforwarding, this will likely be something like http://youripaddress:8123. If you've hosted Dynmap on your webserver, this will likely be something like http://yourwebsite/map/. How can I get high detailed maps? How can I change the order in which the worlds are shown? In this example, the names of your worlds are 'world', 'nether' and 'skylands'. How can I change the name that is shown for each world? How can I hide a world from being listed? In this example both 'nether' and 'skylands' will be hidden, since they have 'enabled: false' in their world-section. How can I remove the cave map? How can I hide certain players on the map? Use the command '/dynmap hide PlayerName', where 'PlayerName' is the name of the player to hide. How can I hide everyone except certain players? Now everyone is hidden. You can use '/dynmap show PlayerName' to show certain players. How can I disable chat balloons? How can I enable night/day on my maps? Now reload the plugin and do a fullrender. 24.10 16:06:10 [Server] SEVERE [dynmap] Failed to start WebServer on null:8123! Yes you need to add port 8123, your host should be able to do that for you. Hey, so I was wondering if showing chat from connected players is hidden from web viewers by default, since currently chat works only in one direction; from the map online to players in-game. Port 8123 is forwarded fully and the map loads fine for anyone viewing it, the only issue is chat getting from my server out to map viewers. My server has a server host, the map was showing another server's map. I took off the dynmap plugin and it keeps showing the other server's map. It's almost like if another server has the same ip as my server. Why is this happening? we got the same issue here. 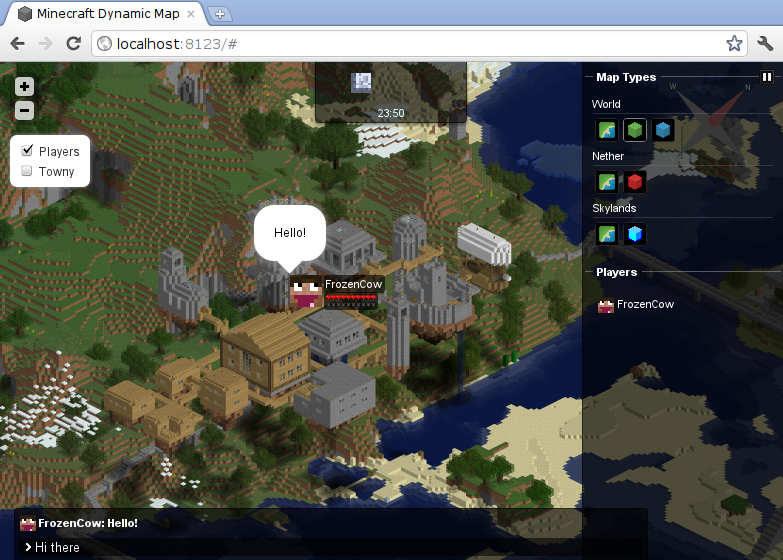 our hoster is running multiple mincraft servers on the same ip. just change the port in the dynmap configuration file from 8123 to some other port (e.g. 11000) and try to load the page with this port. also there should be a message from dynmap in the server logfile that says it could not use the port 8123. My map is messed up, instead of a perfect circle, there is like a strip of land showing next to map and a couple little chunks, how can I start fresh and make it perfect again? Type: /dynmap fullrender or /dynmap radiusrender <radius> No problem. I show my DynMap map on my website. My problem is that the page updates every second. Is there a way to control the update rate for the map? Please help, maybe it is because of my server being 1.24 that the chat bubbles are not working? If chatTagRelationColored in the Factions configuration is true, it cancels all normal chat events, preventing us from processing them. Set it to 'false' to correct that issue. I'm having an issue when I try to full render, after about 30 seconds it spits out these errors: http://pastebin.com/nbM8THgz. I have done fullrender and radius render serveral times >< my map doesnt update at all. It remains the same and its ugly theres random paths where people have walked etc its not all nice nd squared of and nothing i do works.. Ive even deleted dynmap all together and put it back in nothing works..